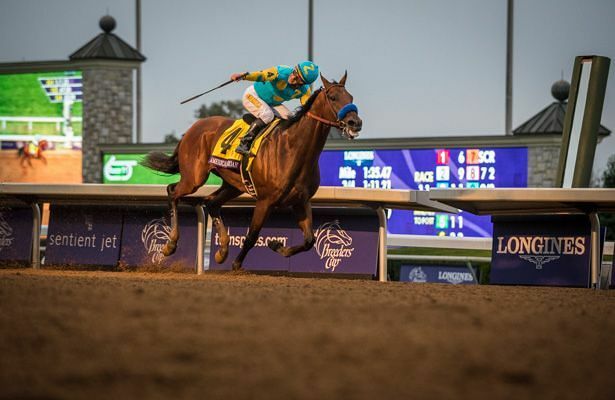 STAMFORD, Conn. – November 3, 2015 – American Pharoah’s final competition made history as the Triple Crown winner raced to victory in the Breeders’ Cup Classic, and NBC posted the highest-rated Breeders’ Cup telecast in 20 years. A venue-record 50,155 watched the event in person at Keeneland Race Course in Lexington, KY, on Saturday afternoon. With his dominating win last weekend, American Pharoah became the first horse to win racing’s “grand slam,” consisting of the Kentucky Derby, Preakness Stakes, Belmont Stakes, and the Breeders’ Cup Classic. NBC’s telecast (5:07-6:13 p.m. ET) earned a 2.6/6 household rating, marking the best rating for a Breeders’ Cup telecast since 1995, when NBC analyst and Hall of Fame jockey Jerry Bailey rode Cigar to his 12th consecutive victory (2.8/9 rating on NBC). The 2.6/6 rating is up 53% from last year’s primetime Breeders’ Cup Classic (1.7/3), which featured Kentucky Derby and Preakness Stakes winner California Chrome finishing third to Bayern. An average of 4.6 million viewers tuned in between 5:45-6 p.m. ET, as American Pharoah ran to a 6½-length victory, up 39% from last year’s race quarter-hour (3.3 million). Viewership for the complete 5:07-6:13 p.m. ET telecast averaged 3.9 million viewers to rank as the best Breeders’ Cup telecast since 2010 and up 50% from last year (2.6 million viewers). In addition, viewers streamed more than 275,000 live minutes via NBC Sports Live Extra on Saturday – more than triple last year’s Breeders’ Cup (88,000).